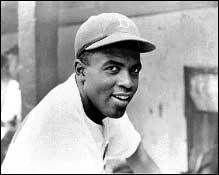 Jackie Robinson Biopic Gets Greenlit!!! Baseball legend Jackie Robinson is getting the motion picture treatment in the form of a big biopic picture of his life and career. Legendary Pictures made the deal today with the Jackie Robinson estate and his widow Rachel. Jackie Robinson played baseball for the Brooklyn Dodgers and showed everyone that anyone could play baseball no matter what color, religion, or creed you are. Brian Helgeland will be writing the script and directing the picture. Helgeland wrote L.A. Confidential, Nightmare on Elm St. 4, and Mystic River. This is not a new venture by any means. Hollywood has wanted to do a Jackie Robinson film for years now. Spike Lee once tried to make a Robinson film with Denzel Washington, but ultimately did not fall through. And Robert Redford has wanted forever to make a Jackie Robinson film, but has every time been halted. Robert Redford still wants to be a part of the process and star in the film as Branch Rickey, the Dodgers executive who signed Robinson. Now word on any potential actors for Robinson at this point. I’d like to see Jamie Foxx or Chiwetel Ejiofor go out for this role. I also wonder if they would pursue Will Smith for the role as well. Time will tell. This entry was posted on Wednesday, June 1st, 2011 at 2:36 pm	and is filed under Film, News. You can follow any responses to this entry through the RSS 2.0 feed. You can skip to the end and leave a response. Pinging is currently not allowed. « COMIC BOOK RELEASES FOR THE 1ST WEEK OF JUNE!! !